← Supporting the Troops while you SHOP! You organized a wildly successful collection drive in support of deployed troops? That’s great! You have your own items to donate for care packages? That’s great, too! Now what do you do? If you’re planning to send those donations to Operation Gratitude, THANK YOU for your generosity and support of our patriotic cause! Please read on for all you’ll need to know about getting those donations to us. Please fill out this Donation Form before you send your items to Operation Gratitude. This form is required in order to receive an acknowledgment of receipt from us. b. We accept Letters, Paracord Bracelets and Financial Donations year-round. a. In order to receive an acknowledgment for donated items, you must fill out a Donation Form, follow the instructions and include a copy in every carton. b. If sending more than one carton, a Donation Form must be included in each carton. c. Please indicate the total number of cartons being sent so we can be sure we have received all of them. d. If the donation is a cooperative effort among several parties, for acknowledgment and “thank you” letter purposes, please be specific regarding who is donating items and who is donating postage costs. IMPORTANT: Do NOT send items or candy to this Encino address — they will be rejected or discarded. 5. In-person deliveries may be made during the week, Monday – Friday, 9am to 4 pm. 6. Candy shipments: Must not exceed 50 lbs. per box. Please send Halloween candy by mid-November and please do not send anything chocolate in the months of January-September. Include the total weight of candy you are sending on the donation form. 7. Thanksgiving/Christmas/Hanukah Greetings: We accept cards and letters of appreciation year-round, but if you would like your messages to reach the troops in time for an upcoming holiday, please send them to us 2-3 months in advance to allow us time to screen, sort and send the letters. a. Use a durable, heavy-duty box and pack with appropriate weight for that box. b. Do not exceed 50 lbs. per box, please. c. To protect your item donations in the event of box damage during transit, we suggest you enclose the contents in a zip-lock or other sealable plastic bag. d. Please use the most economical method from your location. You can check the websites of the various shippers (UPS, USPS, Fed-Ex, DHL) and get their respective prices based on weight and size of package. Some of these outlets are allowed to offer discounts, as they are owned as franchises. e. You can try contacting local moving or freight companies – they may be willing to add your donation to their load for very little money (or for free) if they are heading this way anyway. f. If funds for shipping are an issue, you can check with local Veterans’ groups and/or civic organizations (Rotary, Kiwanis, Lions) to see if any would partner with you to cover the shipping. g. Thank you for understanding that Operation Gratitude cannot pay for shipping donations to our facility, as we need every penny of our funds to pay the cost of sending the care packages to the troops: $15/package. h. For information about vehicle donations, please visit the Cars for U.S. Troops website. To donate used cell/smart phones, please visit the GRC Wireless Recycling website. For all other inquiries about Corporate Donations, please email Info@OperationGratitude.com. j. Use of Donations: Operation Gratitude welcomes donations of all products in furtherance of its mission to support our Military. We reserve the right to determine the appropriate use of each donated item, including but not limited to inclusion in our care packages, donation to Military bases or other charities, and/or for fundraising or volunteer appreciation purposes. Have a question that wasn’t answered here? Please send an email to Info@OperationGratitude.com. This entry was posted in Uncategorized and tagged care packages, charity, corporate donations, donate, donations, letters to deployed troops, military, Military care packages, Military support, shipping care packages. Bookmark the permalink. We are so very grateful for — and honored by — your support. Thank you. I am in the process of writing cards to send to the troops. What is the minimum amount of cards I should send to you for distribution. No minimum, Samantha — thank you! More info: http://bit.ly/TakeTimetoSayThanks Please send additional questions to Info@OperationGratitude.com Thanks for your support! I’m a Vietnam era marine veteran who thanks everyone who contributed to servicemen everywhere . Thanks especially for lovely and inspiring letters written by the children. How can I volunteer some of my time to veterans in a similar way. Thank you very much for your service, Luis! There are many ways you can join us to volunteer — here are some ideas to get you started: http://bit.ly/OpGrat9Ways Please let us know if you have additional questions by sending an email to Info@OperationGratitude.com. Thank you again! My non-profit organization is going to be making the hats, scarves and the cool ties for the military this coming year. This is the first i have heard of this program and this is our way of giving back to the military branches for all they do for us. Kim, we’re so glad you found us! Here is where you can find more info on our “Handmade-with-Love” Programs: http://bit.ly/HandmadewithLove Please let us know if you have questions by sending an email to Info@OperationGratitude.com. Thank you for your support! Wonderful, Judy! Thank you! Please let us know if you have any questions — send an email to Info@OperationGratitude.com and we’ll reply asap. Hello! I have hundreds of Beanie Babies I would like to donate. Are you still accepting them at this time? Thanks! Is it ok for us to make our own care packages for the troops and send them to you? I fully understand that you guys need to go through them and might change what’s in them for security purposes, etc. But can we even send a put-together care package to you? Or do you only accept individual items?? Thanks for your interest and support, Kate! We accept individual items to include in our care packages along with items we always send — “handmade with love” gifts (paracord “survival” bracelet, scarf, hat, cool-tie); a small, plush toy; Girl Scout cookies; an Operation Gratitude magazine, etc. All of these fit into our specially-made box. Please let us know if you have additional questions by sending an email to Info@OperationGratitude.com Thank you again! Are comic books ok to donate? Yes — we accept comic books. Thank you! I want to send a care supplies of beanie babies and letters but do not have a working printer. Can I still make the donation by putting in a letter ? Yes, absolutely! Thank you for your support! I just sent a donation of halloween candy. 5 boxes shipping was very expensive. Why is a apo address not used? Thank you for your donation. 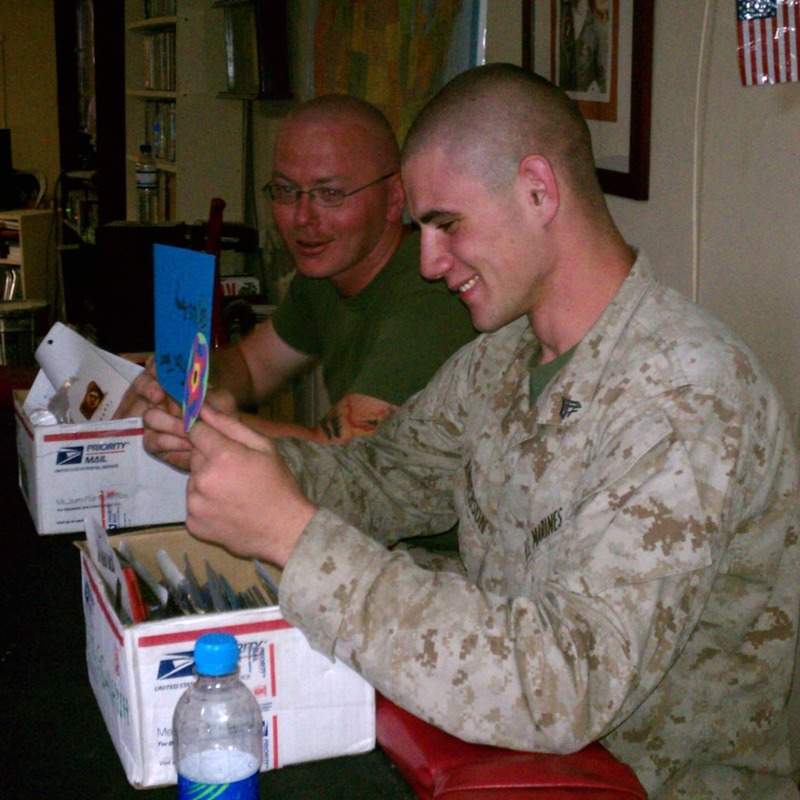 The candy you sent will be shipped in our care packages going to deployed troops serving overseas. Just a quick one. Couldn’t you just coordinate with the Girl Scouts to have them send the cookies from their suppliers in your area, from all the orders they collect, saving the individual Troops the cost of sending them to you? Everyone is trying to do the right thing but the lack of coordination is putting up some unnecessary road blocks to making this even more successful. We would love to coordinate something like that with the Girl Scouts organization, Brent! If you know of a way we could make that happen, please let us know: Info@OperationGratitude.com Thank you for your support! Hello, I just sent over 200 letters ( some being related to the holiday) for processing. I was just wondering will they be discarded because I didn’t send them 2 months in advance? Please do not worry about the timing! We will send the letters as soon as we process and screen them. Thank you very much for your thoughtfulness and support. Reblogged this on The Central KY Patriot. Our Extended Family will be gathering up large amounts of donations (i.e. books) but cannot afford to pay to ship them to you. May we take them to the local Veterans charity organization and have them forward to you through military shipping channels. Many family members are veterans and want to participate in this worthy cause…Some of us participated in sending CARE packages in our schools when we were children during WWII and are planning to introduce this into the local schools as well as generating donations from our family of 40 and some local businesses . I served in Europe for 18 years up to 2003, and our organization sent Care packages to deployed military and civilian support teams who were deployed during all of the conflicts during that time. Thank you for your consideration to this request. Thank you for your service and your support, Pat. If shipping costs are too prohibitive, we recommend finding a local military support charity near you and donating there. We know of no special “military shipping channels” that would be able to forward the items you collect to us. My son is a Shriners patient he is 7 years old. Every time he goes to the hospital he receives a Beanie Baby or two, he has quite the collection. He does not play with them, do you collect these items? Yes — we do. 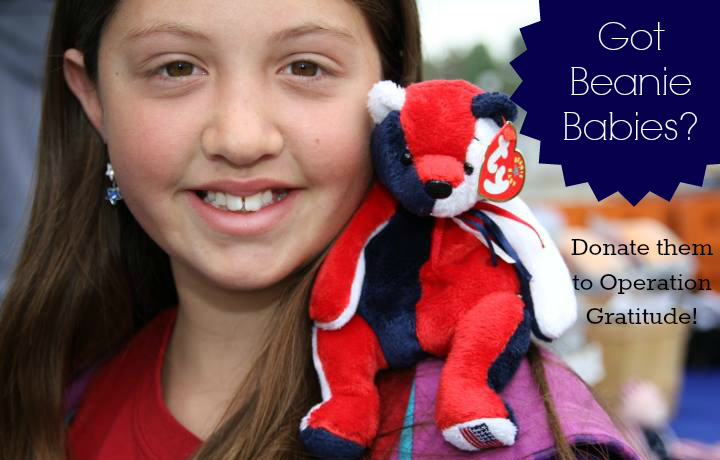 Find more info here: https://opgrat.wordpress.com/2013/06/09/beanie-babies-for-the-troops/ Thank you — and your son! — for the support! Where should I send care packages for Wounded Warriors? Brittany, all the assembling and shipping of Operation Gratitude care packages must take place at our headquarters in Van Nuys, CA for security purposes. If you would like to send donations for our wounded warrior care packages, please refer to our shipping and donation information you find here. If you have additional questions, please send an email to opgrat@gmail.com Thank you for your support! Pingback: FoodPlay Productions - Five Servings of Fun! Is there any way a person can send a letter to one of our soldiers? Thank you! Thank you! Thank you!! For all you do to support our Military….you are such a blessing!